€150 Tradesmen.ie Credit. For getting new work, it’s the business. Tradesmen.ie is a website that helps tradesmen like you find painting and decorating jobs in their local area. Tradesmen love that it’s an easy way for them to grow their business locally. And customers love it because they’re getting rock-solid quotes from tradesmen they know can trust. So everyone wins! Here’s how it works: The customer fills in the simple online form, detailing the job they need done. Then suitable professionals on the tradesmen.ie database are invited to quote for that particular job, and four of these quotes are sent on to the customer. Find out more at tradesmen.ie. - If you’re not already registered with Tradesmen.ie, we’ll give you free registration, plus €70 Tradesmen.ie account credit. 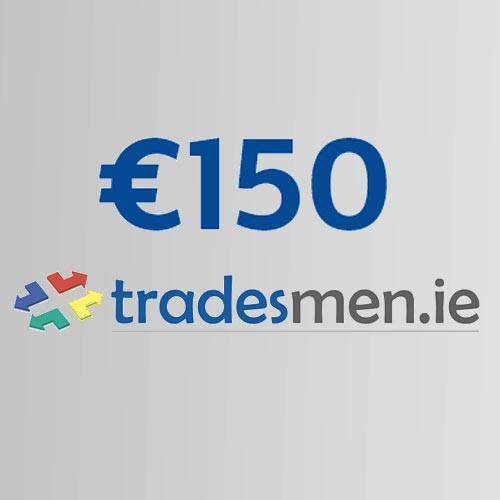 - If you’re already registered, we’ll give you €150 account credit to use on the Tradesmen.ie website. Click ‘Redeem’ and your Tradesmen.ie Credit will be requested. You’ll need to specify whether or not you’re already a registered member of Tradesmen.ie with the Dulux Trade Points Helpdesk. Your code for Tradesmen.ie Credit will then be on its way to you by email within 2 working days. 2. New members of Tradesmen.ie are required to submit a photo ID, a minimum of 5 references from previous customers and to have their address verified for acceptance. 4. The promotion is not valid in conjunction with any other promotion. 5. There are no cash or other alternatives available in this promotion. 6. The promotion is not open to employees of Barrowvale Technology Ltd T/A Tradesmen.ie, TLC Marketing or Dulux. 8. If the Dulux Trade Points member is already registered with Tradesmen.ie they are required to email the code to info@tradesmen.ie together with their Tradesmen ID and the €150 credit will be added to their account.